This article forms part of my series on CAR SYSTEMS , and gives some additional information to help you get started. Whatever system you end up using, the basics are pretty much the same, and it is probably good to know what your options are. 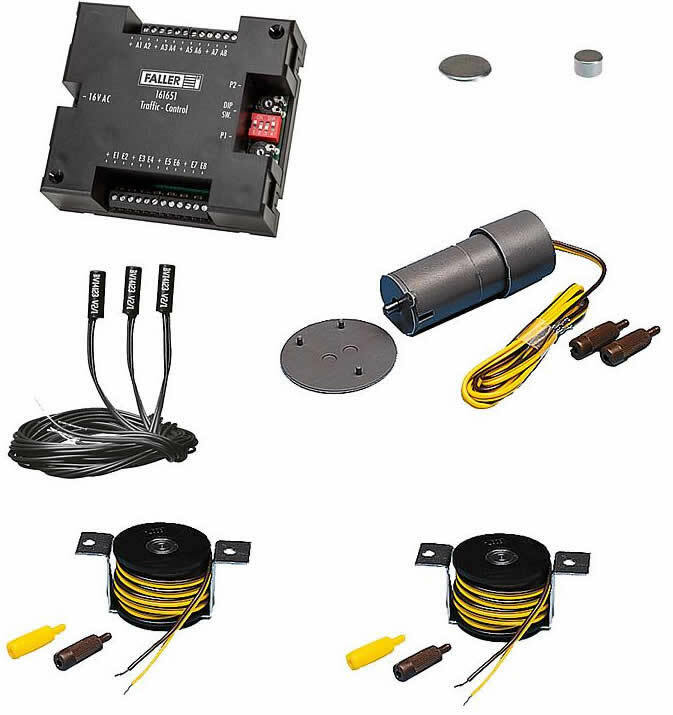 Keep in mind that while there are other systems available and under development (such as Faller’s new V3 system, that uses Ultrasonic sensors to determine the position and send commands to vehicles in real time), the most common, practical and cost-effective method available to the modeler -at this point in time- is still the basic guide-wire approach..
as we can debate this point endlessly.. Please refer to my Road Construction Article for more detail about each type of road system, as well as some practical advise to get started. Each of the systems uses a slightly different guide wire, requiring a different type of magnet, and that the correct magnet needs to be fitted to a vehicle for proper operation. By now you should know that vehicles follow the road by means of a small magnet attached to a steering arm – Embedded in the road surface is the guide wire. It is important to note that there are various types of guide wires, with slight differences between each type and that, if not taken into consideration, you may want to re-read this when you vehicles start misbehaving! A quick note: Somewhat confusing is the fact that Faller also refers to their product as “Contact Wire” and then also as “magnetic tape”. The tape is 1 mm thick and 3 mm wide and typically sold in 1m length very flexible. It can be inserted into a machined groove or placed on top of the roadway. The tape provides a better guidance of the vehicles than the wire. It does not affect reed switches – because it is not magnetic! The magnetic strip is 3 mm thick and 3 mm wide and flexible. It can be inserted into a machined groove or laid under a thin road. The magnetic strip provides better management of vehicles than the wire. A road surface up to 2 mm is possible if the tape is laid out below the road surface. The magnetic strip is 3 mm thick and 6 mm wide and flexible. It can be inserted into a machined groove or laid under the road. A road surface up to 3 mm is possible if the tape is laid out below the roadface. 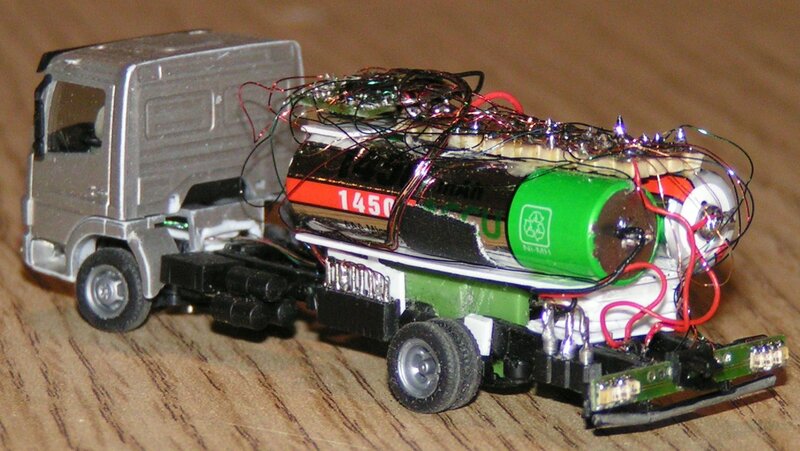 For Mader-Magnet-Trucks it has to be laid at the surface so that the Mader-reed switch is activated. On such a road with no junctions and crossings Faller vehicles can not be used. Small cars get stuck on the road. This largely depends on the brand of vehicles you intend to run. 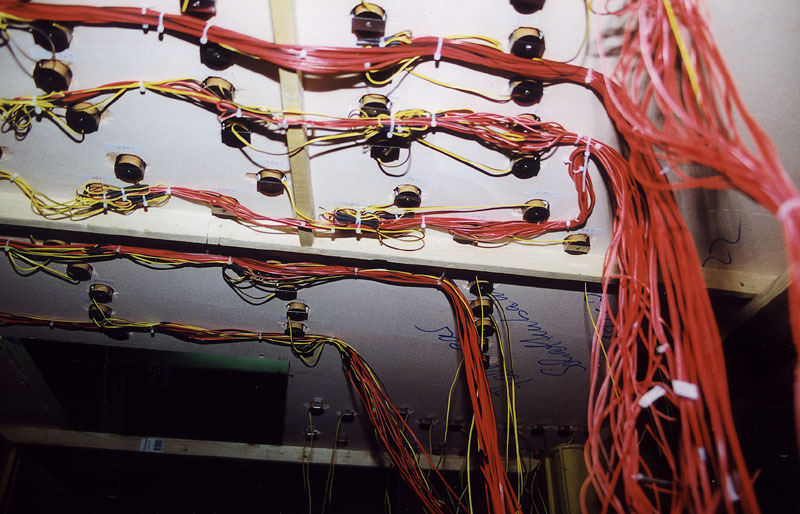 If you go with Faller, it makes sense to use their wire (but not required), likewise it makes sense to use Maders magnetic tape if you intend running any of the Mader trucks. My advise: Stick to one type of wire, test run your installation before fixing anything, and make sure vehicles use the same type of magnets appropriate for the type of wire. 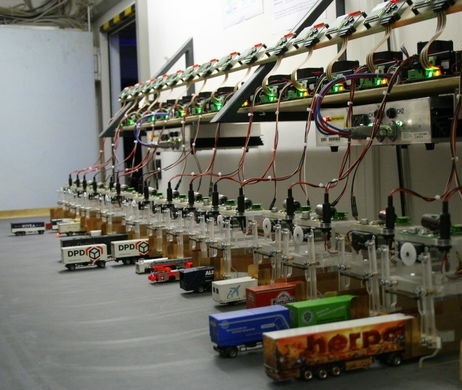 Vehicles are probably the most important component of any car-system are the vehicles – after all, this is what you and visitors to your layout want to see..
Vehicles can range from cars, trucks, delivery vans, buses, boats, santa’s slay.. (pretty much anything that can move)! However you will quickly find that, due to a lack of commercially available options, most often you will have to “kitbash” your own. Chassis, steering, wheels and motor, almost there. Most people tend to start out with Faller before moving onto the other systems. Faller vehicles are essentially “dumb”, although they can react to start/stop/delay control points. With Manual Control, I refer to the control of vehicles by means of a system that does not require connection to a computer or central command station. so by adding a few components you can have the vehicles start, stop, pull into a car wash, etc – all this without having to connect to a computer, yes you are now running under Automated (but Manual) Control! Remember that using a DC-CAR equipped vehicle will give you distance control and vehicle collision avoidance out of the box, as this is a function of the chip on board the vehicle. Every manufacturer has developed add-on components that allow you to build more realistic and interesting roads. 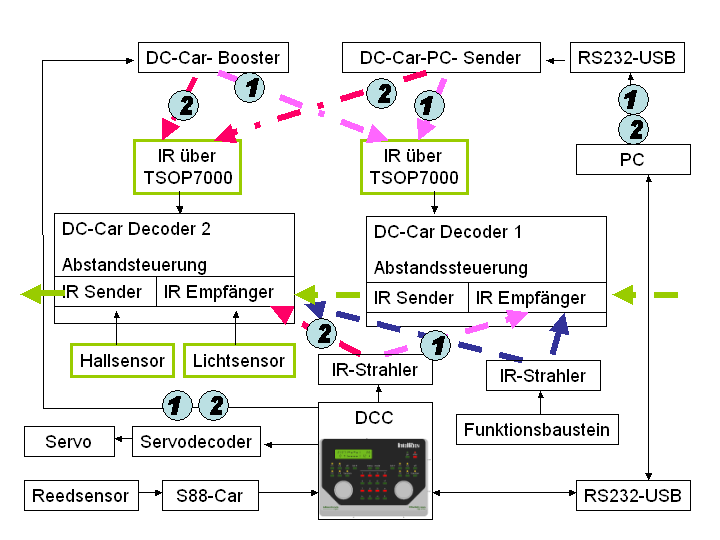 Components are the standard functional elements which you can use to control the Car System traffic on model systems. When activated, the stopping point creates a magnetic field. This magnetic field causes the reed sensor in the vehicle to open and the current supply to the motor to be interrupted. The vehicle stops. When activated, the magnetic field of the junction diverts a vehicle onto a second, branching contact wire. 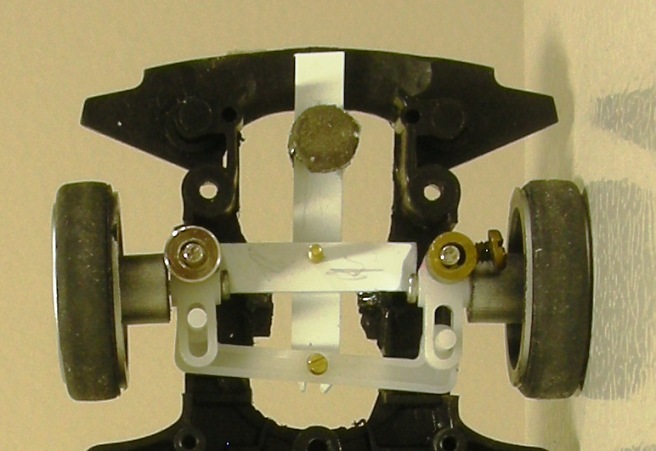 This is done through the magnets on the vehicle’s steering slider. The parking area has a permanent magnet which stops vehicles without electricity, even for a long period of time. When the parking area is activated, an integrated electric coil briefly interferes with this magnetic field. 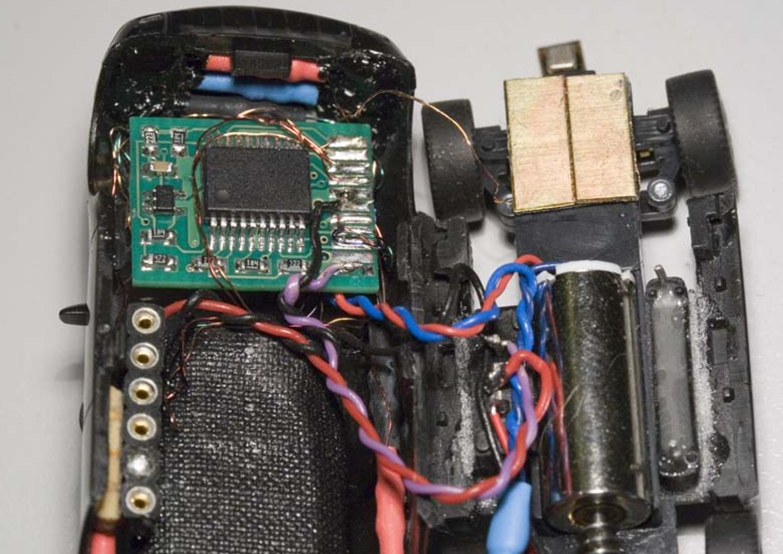 This closes the reed sensor in the vehicle and supplies power to the motor. The vehicle starts moving. 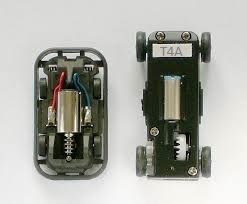 Typically, Sensors embedded in the road are activated by magnets on the vehicles when driven, resulting in the activation of one or more control action/element. This can also be achieved by means of Infra red signals being sent/received by vehicles as in the case of the DC-CAR and INFRA-CAR systems. Please refer to each system for more detail of available control modules and methods. 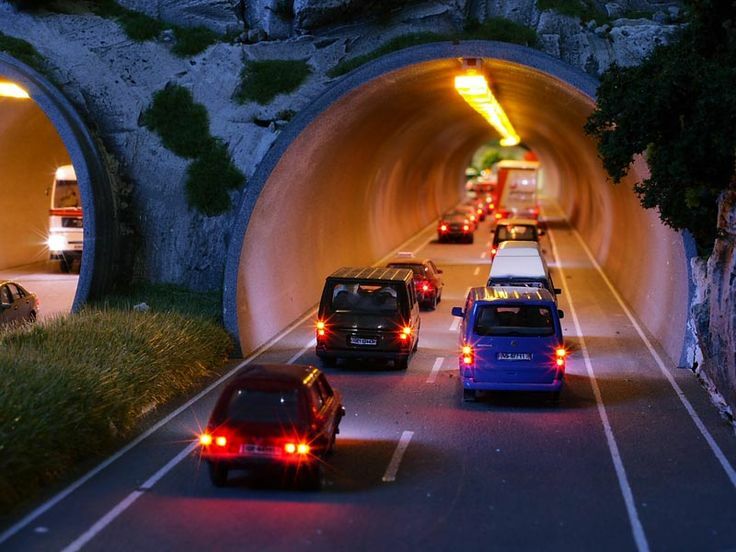 Miniatur Wunderland provides a very impressive example of how a vehicle system ca be controlled via computer. Every aspect of operation and maintenance is controlled by means of various sensors, feedback modules, and software. Sit back, dream, plan and budget..then decide to what extent you can afford to computerize! No seriously, be realistic!